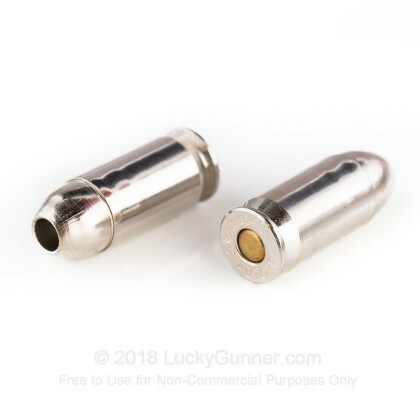 Looking for a high performing, yet light weight self defense round? This ammo has increased velocity, accuracy, and barrier penetration. Liberty Ammo has created extremely accurate defense ammunition with reduced recoil in comparison to traditional hollow point ammunition. Liberty ammunition has unparalleled stopping power and terminal effects. Liberty Ammunition’s products are all new production, non-corrosive, require no weapons modifications and the cases are reloadable. Liberty Ammunition was founded shortly after 9/11, and is a world leader in lead-free ammunition, and their sole pursuit has been to develop the world’s highest performing ammunition. Liberty Ammunition holds multiple small arms ammunition patents. 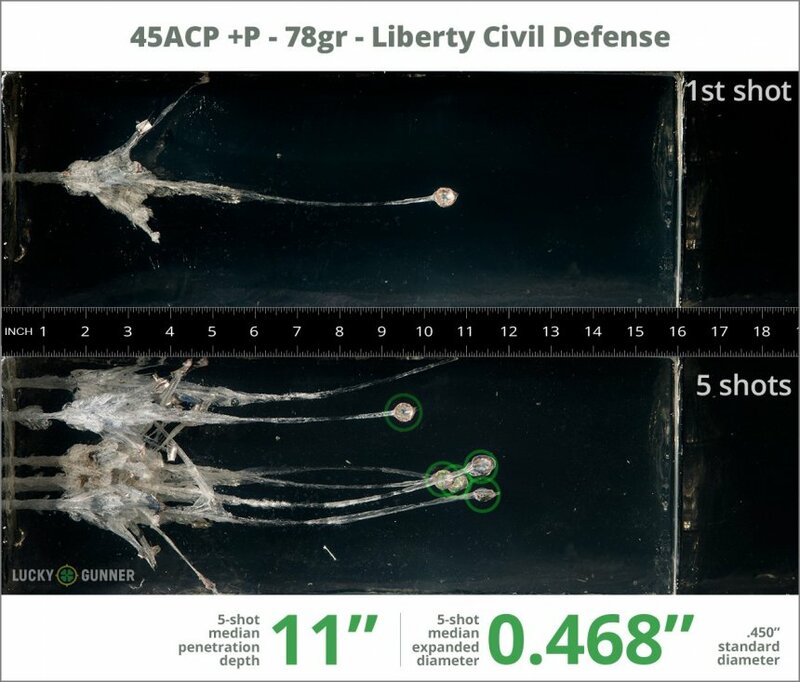 Using this patented technology, Liberty Ammunition has developed ammunition with exceptional accuracy and performance. Liberty Ammunition entered the civilian market with the highest performing ammunition in the world. Liberty Provides superior personal protection and enhanced game hunting experience through their committed pursuit to innovation and quality. 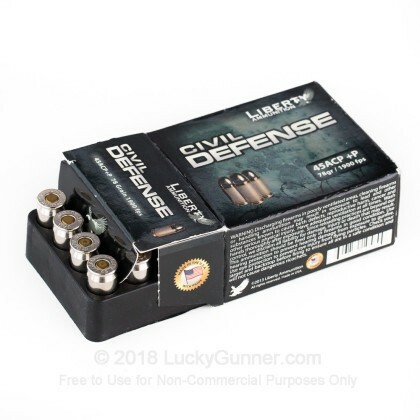 Liberty Ammunition offers a broad range of products for the military, law enforcement, civilians, and hunters. 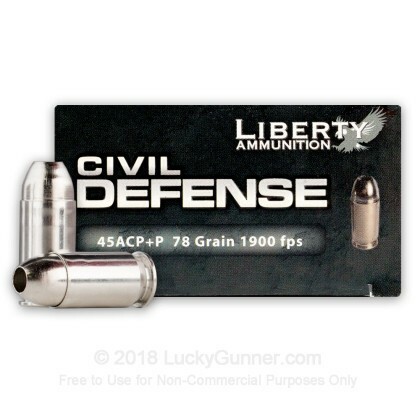 We test fired five rounds of .45 ACP (Auto) Liberty 78 gr Civil Defense +P into synthetic ballistic gelatin to observe its expansion and penetration characteristics. The ammo was fired from a Kahr CW45 pistol at a distance of 10 feet. A four-layer barrier of heavy fabric was placed in front of the gelatin to simulate clothing. 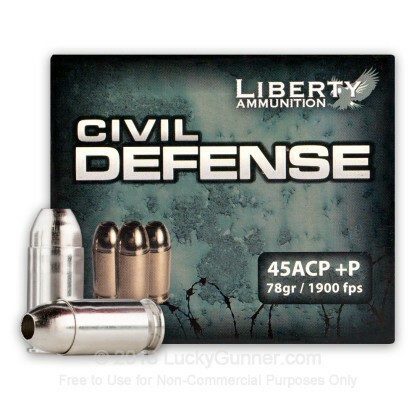 How do the results for this Liberty Ammunition .45 ACP (Auto) compare to other 45 ACP Ammo? 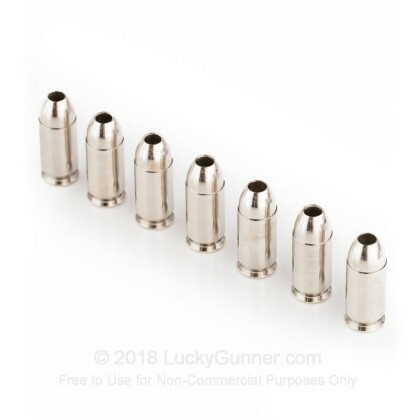 1.04" This ammo: 0.47" Min: 0.45" Median: 0.64" Max: 1.04"
11" 0" 8.3" 16.7" 32" This ammo: 11" Min: 8.3" Median: 16.7" Max: 32"
Wow! I bought a box of these after watching the ballistic gelatin results above. At the range yesterday I decided to try a few and they are pretty cool. 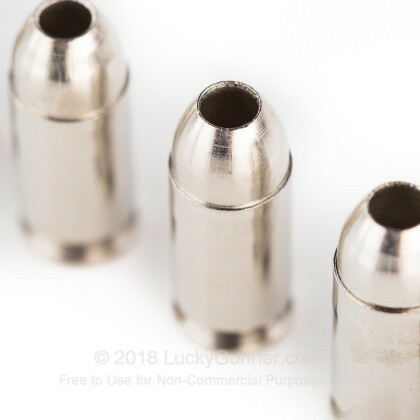 I shot them from a H&K USP Compact 45 and it spewed a flame out the muzzle about 18" and it sounded like a .50 going off! The guy in the booth next to me looked around the corner with a really surprised look on his face after my first round. Even with all that noise and flame the recoil wasn't all that bad. No more than any other .45 +P I've shot. So now I need to order another box since I just about shot up the whole first box. It was just too much fun to stop! The critical defense is phenomenal, high velocity yielding dramatic hydraulic results in wet mediums. Low recoil and very light weight , (your magazines feel almost empty, nice if you're packing high caps with a couple spare mags). Shooting through metal doors and tanks it outperformed 230 ball ammo for penetration, (similar results on hard dry targets.... It seems to collapse and fold in on itself with dry media, wood etc. over 2000fps from 4 5/8" !). Don't sell it short.